Photographer and free diver Eiko Jones wows audiences by showcasing the world beneath the ice in Campbell River, home to internationally acclaimed free divers. A group of free divers in Campbell River, B.C. 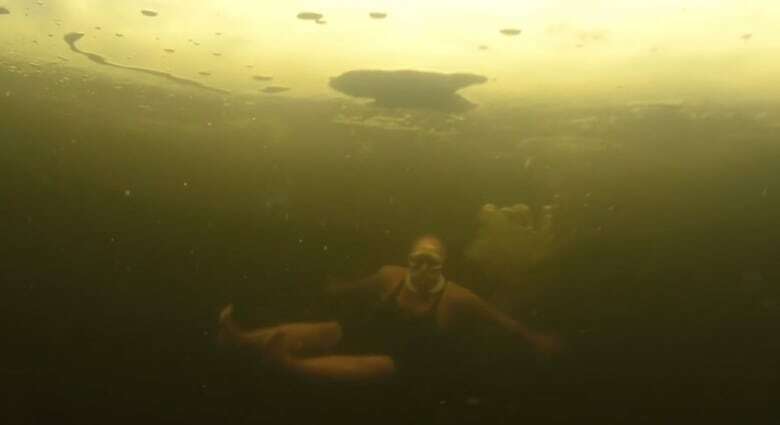 marked the new year with a chilly swim under the surface of a frozen lake, and they have the video to prove it. On New Year's Day, photographer Eiko Jones recorded fellow diver Magali Côté as she entered the water without a wetsuit. 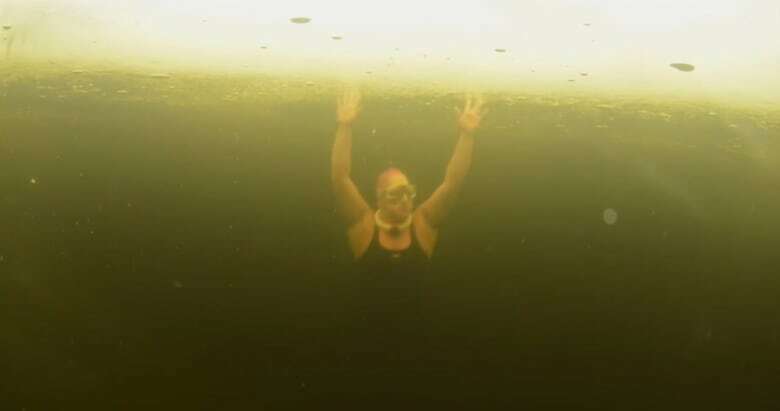 "She was doing some training with us and she jumped under the ice, so we shot the video," Jones told host Gregor Craigie on CBC's On the Island. Jones admits that free diving can be dangerous, especially without a wesuit — and in a frozen lake. "Everything has risks, but managed properly things are fine," he said, "We had safety protocols in place. We had safety lines in the water. We had scuba divers in the water." "There was plenty of safety aspects covered, but certainly it's not something people should just go do without the proper training." Free diving is a lot like scuba diving without the scuba gear. Jones says he only recently started free diving, and can currently make it 20 metres below the surface. More advanced free divers have gone more than 100 metres beneath, including world record holder Herbert Nitsch who reportedly dove to a depth of 214 metres. Jones said the free diving community in Campbell River is growing and boasts many international talents, including world champion Mandy-Rae Cruickshank. As he continues to hone his craft by training with some of the world's best, he says part of the appeal is unearthing your body's potential — especially in the cold. "It's amazing in that cold water how long somebody can go, even without a wet suit, once your body has adapted and the blood is shunted out of the extremities into the core," he said. "It's amazing that somebody can actually spend 15, 20 minutes in that cold water without a suit, and still be quite functioning." The tranquility of being beneath the surface is also part of the activity's appeal. "It's pretty amazing experience.... basically you're in the water like a fish and it's an incredible feeling. It's quiet. It's beautiful. It's serene. Of course [since] you're holding your breath, you have a limited time compared to scuba diving." "But the time that you spend is very perfect."